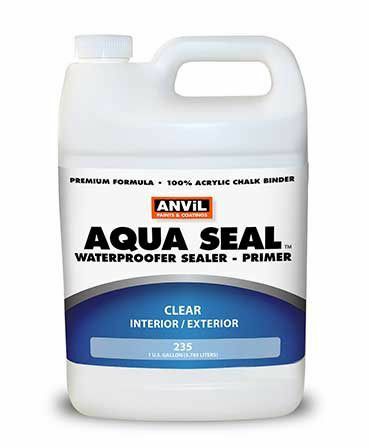 AquaSeal Penetrating Primer/Waterproofing Sealer provides excellent results for stucco, cement, brick and masonry vertical surfaces. Environmentally safe and very low VOC make it a universal sealer insuring maximum bond of topcoat paints. 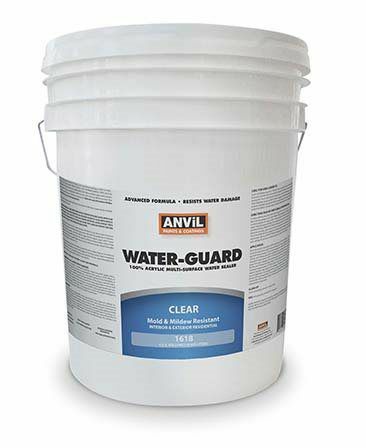 Anvil #3200 Water Lock-Out Masonry Waterproofing Coating is an styrene acrylic micro plating coating that is specially formulated to prevent water seepage through interior/exterior porous masonry and concrete block walls in above and below grade applications. 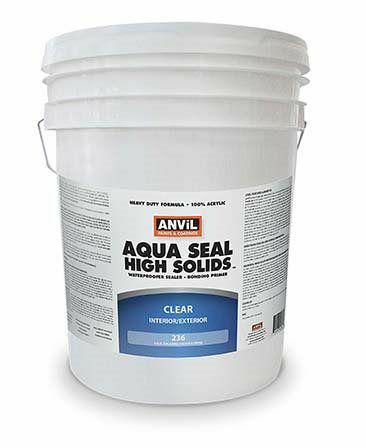 Anvil 236 AquaSeal II High Solids Waterproofing Sealer is fast drying,water clean up, environmentally friendly, penetrating sealer/primer for porous vertical surfaces. It is specially formulated with 25% clear acrylic resins that penetrate and bind to low density masonry. The dried film is resistant to mildew for it contains agents which inhibit the growth of mildew on the surface of the sealer film and is also resistant to acids, and salts. AquaSeal II provides a tough and flexible film with excellent scrub resistance and weatherabiliy. May be tinted with latex paint or stain. May be mixed with equal parts of latex paint for use as a primer. Mix with exterior latex paint to increase weatherability of the paint. May also be used as a binder sealer by adding one gallon of AquaSeal II to five gallons of block filler. AquaSeal II is an exceptional binder for heavily chalked surfaces to improve the adhesion of paint topcoats. 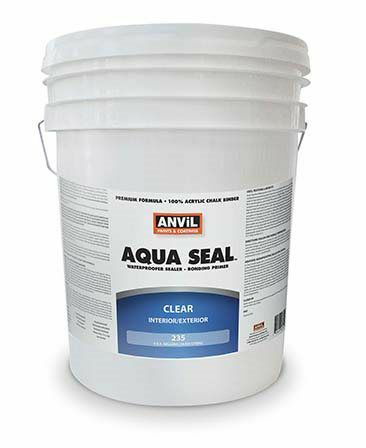 AquaSeal II protects and seals vertical surfaces of CMU (Concrete Masonry Units), Tilt-Up, Decorative & Fluted Block, Split Face Block, Low Density Brick, Stucco, Limestone, Coral, Grout, Adobe, Chalky Surfaces, Terra Cotta Roof Tiles, Roof Shingles, Pottery and many other porous surfaces. Elimination of cascading or ponding water must be addressed prior to AquaSeal II application. Designed for above grade use only and should not be used on applications exposed to hydrostatic water pressure. Waterproofing Sealer has surpassed requirements for water repellency set forth in Fed. Spec TT-C-555B, Section 3.3.3. A fast drying, water clean up, environmentally friendly, multipurpose penetrating sealer/primer for vertical surfaces. It may be applied as a stand alone, clear sealer or top coated with elastomeric, latex or oil based coatings. The dried film is resistant to mildew for it contains agents which inhibit the growth of mildew on the surface of the sealer film and is also resistant to acids, and salts. Provides a tough and flexible film with excellent scrub resistance and weatherabiliy. May be tinted with latex paint or stain. Mix with equal parts of latex paint for use as a primer. Mix with exterior latex paint to increase its weatherability. May also be used as a binder sealer by adding one gallon of AquaSeal to five gallons of block filler. 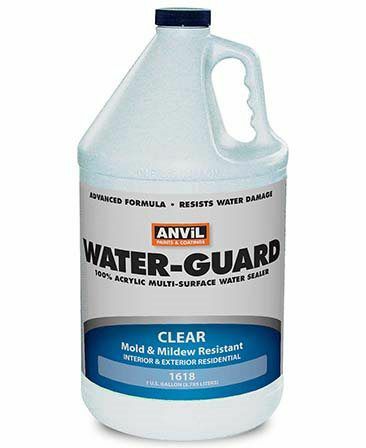 Protects and seals vertical surfaces of Brick, Stucco, Concrete, Grout, Stone, Plaster, Drywall, Adobe, Simulated Brick, Metal, Chalky Surfaces, Terra Cotta Roof Tiles, Asphalt Shingles, Aluminum & Vinyl Siding, Pottery and many other nonporous surfaces. AquaSeal is designed for above grade use only and should not be used on applications exposed to hydrostatic water pressure. Elimination of cascading or ponding water must be addressed prior to Aquaseal application. For porous concrete surfaces such as fluted block we recommend AquaSeal II High Solids #236. AquaSeal Waterproofing Sealer has surpassed requirements for water repellency set forth in Fed. Spec TT-C-555B, Section 3.3.3. 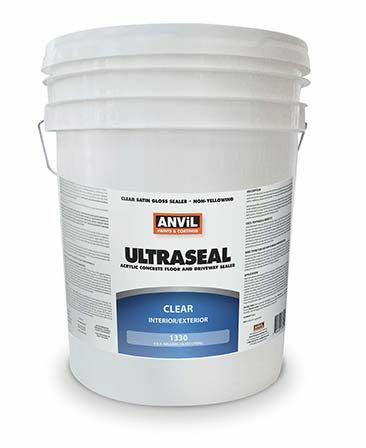 RECOMMENDED USE: Great primer when paired with Anvil's Deck-A-New Deck coating product. Provides a tough and flexible film with excellent scrub resistance and weatherabiliy. May be tinted with latex paint or stain. Mix with equal parts of latex paint for use as a primer. Mix with exterior latex paint to increase its weatherability. Designed for above grade use only and should not be used on applications exposed to hydrostatic water pressure. Elimination of cascading or ponding water must be addressed prior to Aquaseal application. For porous concrete surfaces such as fluted block we recommend AquaSeal II High Solids #236. AquaSeal Waterproofing Sealer has surpassed requirements for water repellency set forth in Fed. Spec TT-C-555B, Section 3.3.3. 100% Acrylic Clear Multi-Surface water sealer that protects wood, brick, concrete and allows wood to weather naturally. Prevents water inflitration, beads and waterproofs use on decks, fences, brick patios, concrete walkways, residential driveways, masonry, CMU’s, flagstone, stucco and other interior/exterior surfaces. This product is milky-white when applied to ensure complete coverage, but dries to a clear transparent moisture barrier. The dried Water- Guard is resistant to mildew for it contains agents which inhibit the growth of mildew on the surface of the sealer. This product is milky-white when applied to ensure complete coverage, but dries to a clear transparent moisture barrier. The dried Water- Guard is resistant to mildew for it contains agents which inhibit the growth of mildew on the surface of the sealer. Anvil 1340 UltraSeal Commercial Urethane/Acrylic Floor Sealer is specially formulated with an aliphatic urethane acrylic co-polymer that provides excellent cleanability and stain resistance. It is low odor, water reducible and non-flammable. It provides a clear high gloss protective topcoat on fully cured concrete, previously coated and painted floor surfaces. Used as a clear coat in general light duty commercial, residential and over fully cured latex, oil, and xylene, coated surfaces. Excellent gloss retention and non-yellowing in both interior and exterior applications. Brush, roller or spray in both horizontal and vertical applications can be successfully achieved with UltraSeal #1340. New regional Volatile Organic Content (VOC) regulations (SCAQMD) differ from the U.S. Environmental Protection Agency (USEPA AIM) national standards, this product can not be sold or shipped to the following area: the greater Los Angeles basin. Provides a hard satin gloss finish that is water resistance. Exhibits good resistance to most solvents and some chemicals, as well as oil and gasoline spills. Brush, roller or spray applications can be successfully achieved with UltraSeal #1330. New regional Volatile Organic Content (VOC) regulations (SCAQMD) differ from the U.S. Environmental Protection Agency (USEPA AIM) national standards, this product can not be sold or shipped to the following area: the greater Los Angeles basin.